Sometimes, it’s a real pleasure to listen to a CD when everything falls together like it should. The songs are great, the performances are top notch, and it’s obvious everybody involved is fully committed. 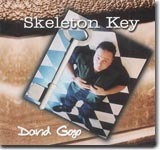 David Gogo’s latest release, Skeleton Key (Cordova Bay Records), is a rollicking ride through the blues, soul, and rock & roll, and all the pieces fall into place. The opening track, a rock & roll original by Gogo entitled “Jesse James,” kicks off the disc in roaring fashion. The following track, “I Can Still Hear You Crying,” is a slower number where Gogo really expresses his pain and loss through his anguished vocal and mournful guitar solo. The edgy “Stay Away From My Home” picks the tempo back up with some superlative harmonica by Gerry Barnum, and slide work by Gogo. The title track has its roots in Memphis soul, while the cover of the late Albert Collins’ instrumental “Backstroke” would surely make the Master of the Telecaster smile. Most of the remaining songs are also covers, including a riproaring cover of Otis Spann’s “Walkin’, a moody take on “Reap What You Sow,” and a ’60s-esque version of Willie Dixon’s “It Don’t Make Sense (That You Can’t Make Peace).” Even more interesting are the two remaining covers, as Gogo converts Stevie Wonder’s “Signed, Sealed, Delivered” into a slow burner and Depeche Mode’s “Personal Jesus” is given a bluesy treatment. Mixed in with these are two more Gogo originals. “Things Are About to Change” reminds me of an electric Texas blues shuffle and “Belgian Moon” is a funky rocker that seems to end too fast. The closer, “Fool For You,” is a soulful cover of the Curtis Mayfield classic. Gogo’s guitar and vocals are excellent and the band (including Barnum, Billy Hicks on drums, Todd Sacerty on bass, and Brendan Hedley and Rick Hopkins on keyboards and organ) provides wonderful support. Gogo also produced this one, with help by Rick Salt, and so far, Skeleton Key is a runaway choice for one of the best releases of 2006. All contents Copyright © 2006, Blue Night Productions. All rights reserved.